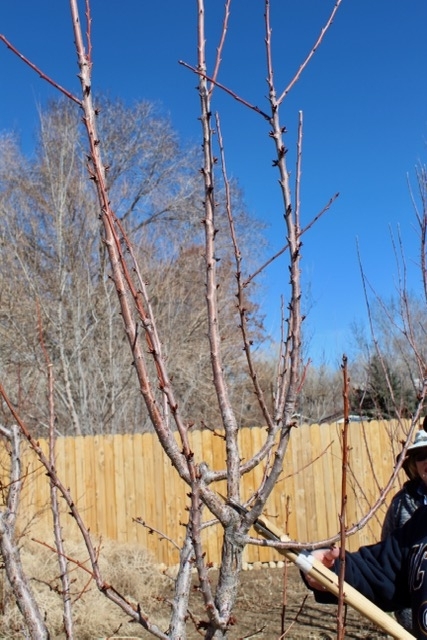 If you have not already done so, it is time to prune your young fruit trees! 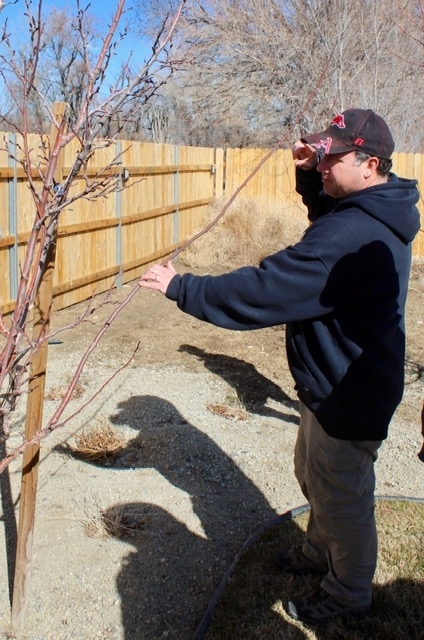 On February 25, 2019, Dustin Blakey demonstrated how to prune young fruit trees to a group of about 25 Master Gardeners and other home gardeners at the home orchard of Kristin Ostly. This discussion covers some of the high points of his demonstration. The primary purpose of pruning young trees is to develop structure so that the trees will be productive in the long haul. There are two primary shapes that can be chosen: the “vase,” or the “Christmas tree.” The vase shaped, or open structure, is the most commonly used in the home orchard. This method keeps the center of the tree free of large branches to allow sunlight to reach the lower fruiting wood. The Christmas tree shape, also known as the central leader system, is frequently used in commercial orchards, to allow trees to be closer together. This method keeps trees with lateral branches arranged in separate layers and branches in lower tiers wider than those in upper ones. An important goal when pruning a young tree is to develop branches near a 45° angle, to encourage fruiting and strong support. Since many trees like to grow branches straight up, it is sometimes necessary to guide the branches by tying a branch to a stake or other fixed point to encourage the branch to grow at an angle. The guide can be removed after a year. Plastic and wooden spacers also work well for this on young branches. As Dustin proceeded to demonstrate young fruit tree pruning he moved from tree to tree and consistently: (1) removed branches that grew to the inside of his desired vase shape; (2) where branches were competing for space, chose the more vigorous branch to survive and cut back the competing branch; (3) removed dead wood and suckers; and (4) removed branches to keep the open center, removing branches that would overly shade lower fruiting wood. For further information see Training and Pruning Deciduous Trees, Publication 8057, UC ANR. Late June Drop of Gravenstein Apples. If you have fruit trees you are probably now getting a little tired of raking up fallen fruits which are the result of a natural occurrence known as the “June Drop”. This year the phenomenon is extending well into July, to the point that one wonders if there will be a crop left to harvest. So what is normal, and when do our trees need help? Apples and pears produce several flowers on each cluster in spring, and depending on pollinator activity, and the local availability of another apple to cross pollinate, many, many flowers may set fruit. However, there will also be numerous little fruitlets that did not get pollinated properly, are damaged by insects, or require more carbohydrates than the tree can produce, and these fruits wither and fall off, frequently in large numbers. As the remaining fruits begin to swell many more get attacked by codling moth, are affected by lack of sufficient water, or otherwise get damaged, and since the tree can only support a certain sized crop it goes through another round of shedding, usually beginning in June and continuing until early July, often resulting in carpets of larger fruit on the ground - frustratingly too immature to use for any practical purpose. It is thought that warm nights may cause the fruit drop to be excessive since the respiration rate of the tree causes more carbohydrates to be consumed during the hours of darkness, leaving less available for fruit production. In areas such as ours lack of water will also be a factor, so make sure that you check your irrigation system and remember to seasonally adjust the amount. A mature semi-dwarf tree can produce over 400 pounds of apples which, after all, are made up mainly of water! 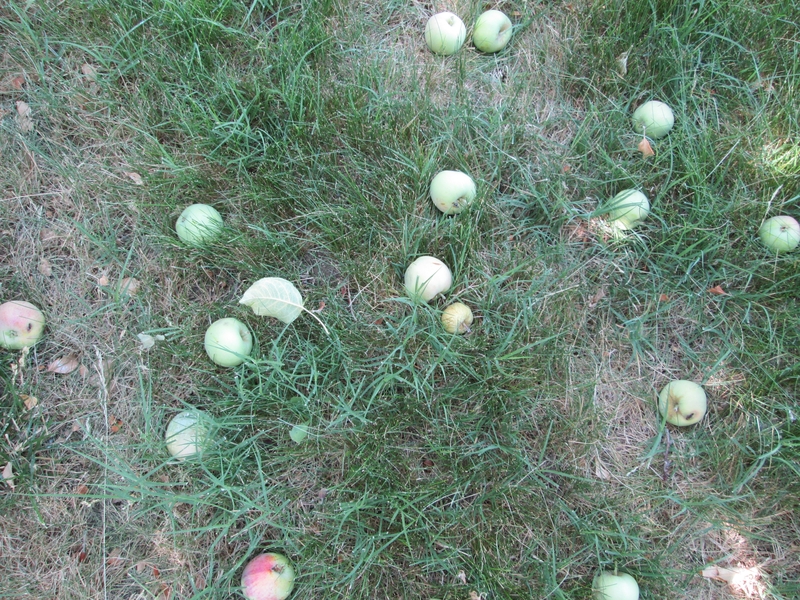 Generally speaking, if the tree looks healthy and has a heavy crop of fruit falling in mid-summer should not be cause for concern. 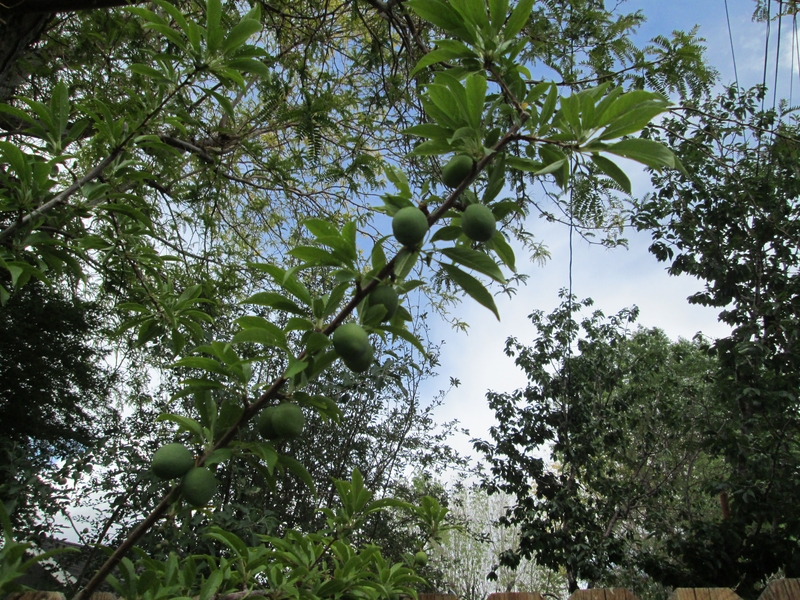 Optimum growing and pollinating conditions lead fruit trees such as apples, peaches and plums to set far more fruit than the tree can sustain to maturity. 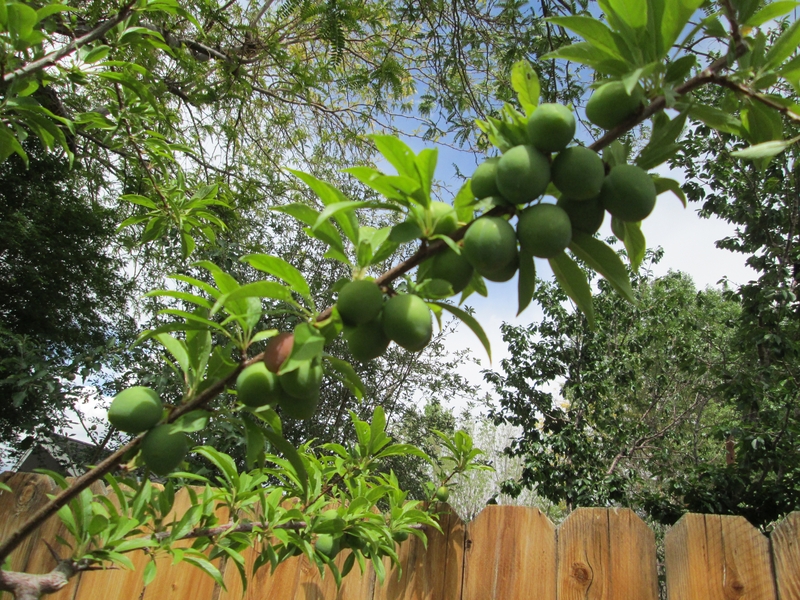 If all these fruits are left on the tree they will be small and of poor quality and the total weight of such a load on the branches will cause them to break off or split at the crotch, often causing severe damage to the tree. Crowded fruits also encourage pests such as codling moths and diseases such as brown rot and scab. Over-cropping prevents the tree from putting energy into producing flower buds for the following year which will be detrimental to that crop. Apple varieties with biennial patterns of production - those with cycles that produce a bumper crop one year and nothing the next - may be induced to fruit annually by drastically thinning early during the productive year, even to the point of removing all flowers from alternate spurs. Many trees shed part of their crop naturally, a process known as “the June Drop” but which can begin during May in California. However, this is often not sufficient to produce quality fruit at harvest. One of the most psychologically challenging tasks that a gardener faces is removing perfectly healthy fruit (sometimes by the bucketful) in order to leave more manageable numbers. The earlier in the season that the surplus fruits are removed, the larger the individual remaining fruits will become. It takes some seasons of experience to judge how many fruits to remove but a steely resolve will be amply rewarded. The largest fruit in any cluster is usually left, unless it is obviously damaged. Apples: These should be thinned to one or two fruits per cluster depending on variety and the overall set of flowers. One fruit per spur 6-8 inches apart is the aim but, if the overall crop is light, clusters of two may be left. Realistically the fruit often grows in frustrating patterns with groups of 5 beautiful apples on one spur and then several spurs with no really good fruits forcing a decision as to whether or not to leave two fruits on the good spur! Fruitlets are removed using scissors or other fine cutters which can reach inside the cluster to the stem. These can be cut close to the fruit and the little stem may be left without any detrimental effect. It is vital not to just pull on the fruit since this will often drag the whole spur off the branch. Some gardeners grasp the stem of the fruit between their first two fingers and “roll” the fruit off with their thumb. There are usually a variety of sizes and shapes in each cluster so begin by removing the small, damaged and misshapen ones first. Then there is the agonizing decision of which of the remaining two perfect fruit to leave. I find that usually one has a slightly thicker stem than its partner so I would leave that. In order to get the best sized fruit at harvest the ideal leaf to fruit ratio for apples would be around 75:1 for early varieties down to 40:1 for the later ones, but who's counting! 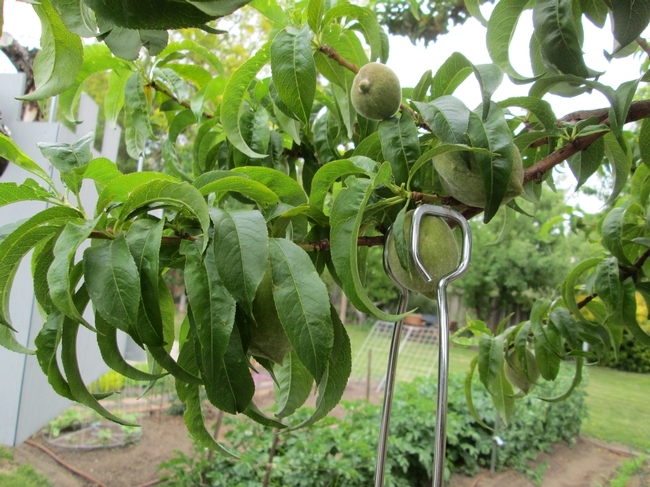 Peaches: The same basic principles apply but a little more space is usually left between fruit – about 6- 9 inches. However they grow much tighter to the stem and are best removed by grasping the fruit firmly and twisting it round until it detaches. For those just out of reach, I have found that barbecue tongs (the sort with a looped end) make an efficient removal tool. Plums: Thin to about 3-4 inches apart. Overloaded plums will naturally drop fruit at the stone hardening stage, so sometimes growers thin in two stages; lightly when the fruits are small, and then finally once the natural dropping has ceased. Cherries and Nuts are not usually thinned. Pears: Often thin themselves, but if extra thinning is needed in order to end up with one pear per spur, the time to do this is when the fruitlets begin to turn downwards. Thinning is undoubtedly a rather tedious business, but when harvest time comes and the fruits are large, lush and healthy, you will be so pleased that you made the effort. All over our region we are receiving reports of fire blight occurring on fruit trees. This bacterial disease primarily infects pears, apples, quince and pyracanthas in our area. While there are a few other species out there that can be affected, it is unusual to see them attacked. Peaches, plums and cherries are not affected by this disease. 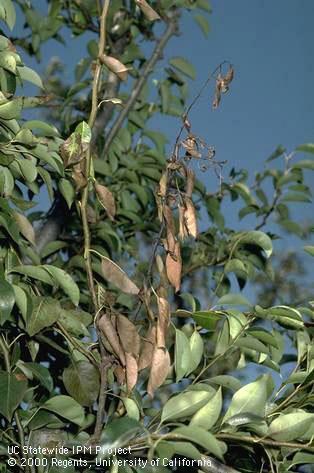 Fire blight is a bacterial disease. It usually gets its start during the bloom period of susceptible hosts. Early on it looks like wilted shoots and flower buds. Most gardeners do not notice the disease until it has turned entire shoots black. This burnt appearance happens suddenly which gives the disease its name. By the time you see burnt shoots, it is too late to do anything to stop it. You're too late now. This summer, plan on pruning out all diseased wood. If you miss any, remove the remainder this winter. Removal of diseased material is important in controlling the disease in the future. The disease is primarily spread through flies and bees interested in the flowers. By removing sources of infection via pruning, your chances of getting the disease diminish. Sometimes this means pruning out a lot of the tree. Disease growth is favored by a certain range of temperatures that occur in spring. In our area this coincides with turning on irrigation which raises humidity. Late spring storms, even if they don't bring rain, do often raise humidity as well. There isn't really an effective spray option available to homeowners. Even farmers have a hard time with sprays of this disease. The UC IPM program has a brief summary of spray options at the end of this informative fact sheet. If you do spray, this occurs during the infection season as a means to prevent the disease. After-the-fact sprays have no effect. Don't bother trying. There are great differences in susceptibility to fire blight by cultivar (variety). If you find that your pear or apple is always being afflicted with fire blight, consider replacing it with a more-resistant cultivar. Usually catalogs point this out.